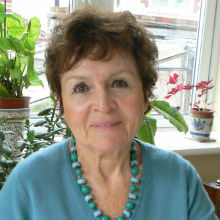 Janine was born in Lwów in Poland (now L'viv, Ukraine) in 1932. Following the Nazi-Soviet Pact, Lwów was occupied by the Red Army in 1939 and remained under Soviet rule until June 1941 when Germany invaded the USSR. Persecution of the Jews of Lwów began immediately, and thousands of people were murdered within weeks of the invasion by the Nazis and Ukrainian collaborators. Janine and her family soon had to leave their apartment and move into an area on the edge of the city, in preparation for the establishment of a ghetto. They were permitted to take only one suitcase and were allocated a small room in a house for the whole family to live in. The house was shared with the family of Janine’s aunt as well as two other families. In addition to the appalling living conditions, they had to live with the fear of frequent German raids. Janine’s parents therefore dug a hiding place under a wardrobe; this was sufficient to protect Janine, her brother and her mother but there was not enough room for the other members of her family – Janine’s father was shot and she never saw her grandmother again. Eventually, Janine and the other surviving members of her family were forced into the ghetto. Soon after arriving in the ghetto, her mother fell seriously ill with typhus and died aged just 29. With other members of Janine’s extended family falling victim to disease or deportation to Bełżec extermination camp, her uncle found a Polish farmer wiling to hide Janine and her aunt Rouja. However, this proved to be the start of a series of new ordeals. Rouja was forced to run away after the farmer harassed her whilst Janine was kept locked away until the farmer told her to leave. Janine’s uncle then found another farming family to hide her and her brother Tunio, but after a few months the family’s daughter brought an SS man to the farm; she narrowly escaped but Tunio was shot. Wandering the countryside, Janine found work as a shepherdess until the Polish family she was living with learnt of her Jewish identity. Fearing for their own safety, they bought Janine a train ticket to return to Lwów. Janine’s aunt Rouja had given her the name and address of a Polish man, Edek, the caretaker of a convent in Lwów, who she should contact him in the case of an emergency. At last, Janine found someone who could be trusted and Edek hid her in the attic of a building, where she was reunited with Rouja, an uncle and 12 other Jews in hiding. As the situation became more dangerous, the group was moved to an underground bunker, where they stayed for nearly a year. However, conditions in the cramped bunker were poor so Rouja arranged for Janine to obtain false papers. She had to learn all of the details of her new identity, which was that of a Polish girl who came from a village whose inhabitants had been killed by Ukrainian nationalists. Janine was then sent to a convent in Kraków, from where she was taken with three other girls to live with a priest. She finally moved to live with an elderly couple, where she worked as a maid until Kraków was liberated in early 1945. Six months after the end of the war, Janine’s aunt Rouja returned for her. She placed Janine in a children’s home, but fearing antisemitism in Poland, they decided to leave for Paris. In 1956, Janine came to the UK to improve her English, where she met and married her husband. They had two sons and two grandsons. Today, Janine still lives in London and regularly shares her testimony with schools.